The Portsmouth waterfront along Bow Street is a unique little spot in this world. In the summertime, it is a lively and bustling place filled with restaurant patrons and good food & beverage, usually with a gorgeous waterfront sunset and a front row seat to industrial river traffic. 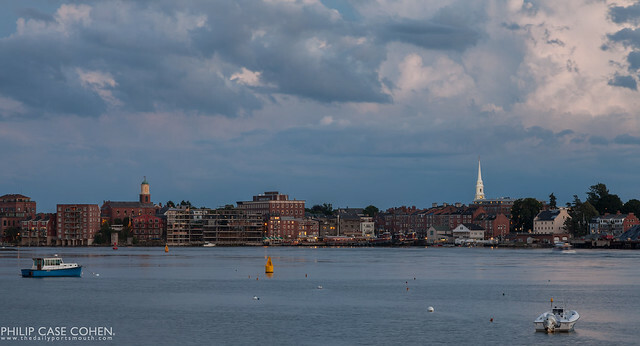 As seen from Maine, the waterfront is a more peaceful and distant place. This was taken following an intense thunderstorm in the late afternoon, with towering clouds hovering over the city. The Martingale Wharf can be seen mid-construction with its iron framing in plain site, after the original building was demolished.